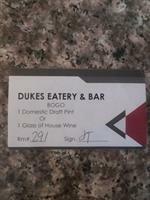 LOOK FOR YOUR "BOGO" COUPON IN YOUR KEY CARD PACKET AT CHECK-IN!! BUY 1 DOMESTIC PINT- GET 2ND 1 "FREE" OR BUY 1 GLASS OF BAREFOOT WINE- GET 2ND GLASS "FREE"! !